Pereless Systems is proud to announce a new Help and Training layout! The layout will go live in the system on December 27, 2018. We’ve completely redesigned the layout of this tab with our clients in mind. Upon entering the portal, clients will be asked if they are a new or returning user. New users will be brought to a “Starting Up” menu which will help them adjust to the new system and new Help and Training layout. Returning users will see new release announcements as well as a complete menu breakdown on the left. 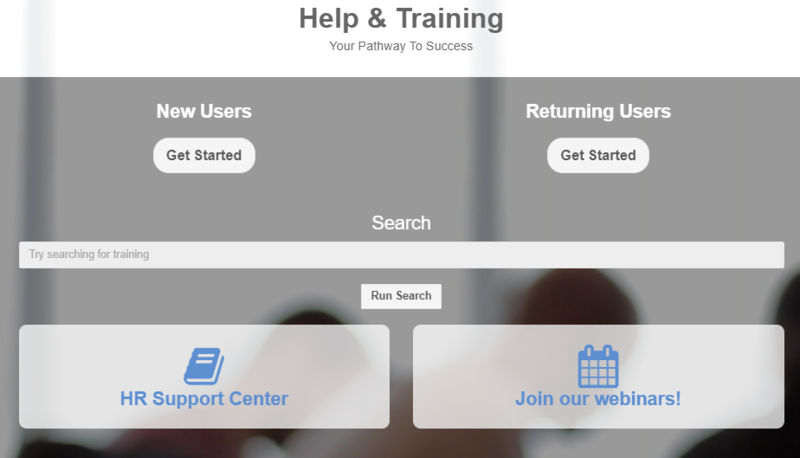 This new, user-friendly menu will bring clients to any section of the Help and Training with one click. The last major change is the ability to search within the Help and Training tab. Your wonderful support team has completely redone all of our User Guides and Training videos. We aim to make sure any help you need is always at your fingertips. In business, partnering is a successful strategy to grow your business. Many companies, both small and large, use partnering as a way to expand their clients and promote their products. By having partners, companies gain the ability to use their partners clients and specific market to grow their own success. Partnering is a way to bring in new business while benefiting another companies success at the same time. For small companies, partnering is very beneficial. By gaining a partner, small companies can connect with more developed companies to expand their client base. It is important for small companies, especially startups, to generate clients from many different markets. This will make their company more competitive in their own market while expanding in other markets. It is also important for small companies to use their partners to market their products. Marketing can be expensive, so when the two partners work together they can market both of their products at one time, paying half the cost. This is also beneficial because both of their clients are seeing the other companies products that are being marketed, which brings attention to both of their products in different fields. When smaller companies join together with companies that are more developed than them, they can grow and develop faster than they would starting up on their own. Although small companies gain heavy growth from partnering, it is also beneficial for larger companies to form partnerships. For larger companies, if they partner with other companies they can make deals to market both of their products even if they are selling to different target markets. For example, if you buy a certain product you can receive a discount on the other companies product. This gives people the incentive to buy both of the products, knowing they will receive a discount. Another benefit of partnering for larger companies is that when they join with small companies or non profits, they can also help improve their corporate social responsibility. If companies do this, people are intrigued by the good intentions of the company, which can bring in more business. It is also beneficial for companies to partner that are not in similar markets, so that new clients can see their products and how the two companies are working together. Overall partnering can bring many benefits to both small and large companies. Working with other companies can help to expand a company’s client base and bring more attention to their company. It is a great way to market a companies products and have something new and exciting to interest their clients. As businesses become more revolved around technology, the use of networking has spiked in the business world. Networking can mean many things, mainly working together with others to benefit multiple parties. Business networking can be used to make connections, apply for jobs, make deals and create partners. The addition of networking in the business world has created many benefits and continues to help it grow. The involvement of networking has also grown from the spike in social media over the past few years, specifically on LinkedIn. LinkedIn is a place where people and businesses can make mutual connections at the click of a button. This has changed the way people find jobs or connect with people. Networking, combined with the advances in technology, have changed how people connect with each other and has made it easier to navigate through the business world. Networking in itself is a way to make connections. If you communicate with others, it is easy to meet new people and make mutual connections. The rise in networking and technology has made making connections an intrical part of the business world. When it comes to finding jobs, having relationships is key to standing out against other applicants. The popularity of LinkedIn has made it easy and simple for people to create a wider range of connections based on their employment history and future work interests. Along with making connections, it is easier to find jobs through networking, especially through LinkedIn and other online sources. By networking on the web, you can research for jobs to find positions that would be fitting to your interests and background experience. Another aspect of networking that is beneficial to business is the ability to find other companies through connections that could benefit a company’s product. This could include partnering with a company to use their product to grow your business. By networking with other companies, you can build relationships that could benefit you and your company in the future. It could also help other companies to promote each other’s businesses and products through deals and marketing combinations. By coming together through networking, companies bring attention to both of their products and give people an incentive to buy and use both of their products. Networking has created new connections in many aspects of the business world. With advances in technology and the popularity of social media, the benefits of networking continue to grow. By building a network for you and your company, you are able to expand and excel throughout your experience in business. Networking comes with many benefits and can help build your company in the future. Although experience might be an important part of some job positions, college graduates bring a fresh perspective to the workplace. In the summertime, many young people have just finished up their degrees and they are actively seeking employment. These new graduates are typically excited to get to work and can learn and adapt quickly. Try to tailor your job applications to be more open to new graduates and you will find yourself with a great pool of applicants. If you are not entirely interested in hiring someone straight out of college for a full-time position, internships can be a great way to seek out potential new employees. An internship allows for you to test the waters and to see if someone who is currently a student could possibly work for you eventually. Internships can be brief and they allows for both the employer and the intern to gain different skills and experience. If you do end up eventually hiring an intern, he or she will already be familiar with the workplace and it will make the hiring process much quicker and easier. As mentioned, candidates are quite active with job searching in the summer. Many people have a much looser schedule at this time, so use this to your advantage to conduct several interviews. This also means flexibility on your behalf, but conducting a wide range of interviews can sufficiently help you narrow down your job applicant pool. Since there are a lot of young people seeking employment in the summertime, this is the perfect time to frequently post on social media. Although active social media accounts are important all year round, make an attempt to reach a wider audience. Despite the warm weather, people still spend a sufficient amount of time browsing jobs in the air conditioning. Some businesses may take a breather from hiring in the summer, but use this time to your advantage and find the best job candidates possible. Whether you like it or not, the impact of Artificial Intelligence has become increasingly noticeable. Companies all over the globe are implementing forms of Artificial Intelligence and Machine Learning that are impacting our lives in more ways than one. Amazon’s personal assistant “Alexa” is an example of conversational AI that allows humans to interact with a machine simply by using the languages we already know. Amazon is not the only company using this type of AI. In fact 61% of businesses in 2017 have implemented some sort of AI, which is up from only 38% in 2016. This constant increase is inevitably going to keep rising, which gives companies the ultimatum: adapt or fall behind. Although many people are skeptical about AI’s impact on unemployment in the workforce, with more advancements in technology it has become evident that it’s positives outweigh the negatives. Rather than replacing humans, machine learning will amplify our skills and make business processes that much more fluid. In the recruitment and software spectrum AI aspects are already paying dividends. Features such as initial resume scans that expedite the first stages of the recruitment process have lifted an enormous weight off hiring managers who are used to the monotonous duty of reviewing hundreds of unfit candidates. In this case, rather than replacing humans and taking jobs, AI will ultimately work together with humans to make the most beneficial impact. By automating the monotonous tasks in business, workers will have more time to focus on increasing productivity leading to more revenue and higher performance. Although there are some risks to Artificial Intelligence such as privacy and some unemployment, there is no denying that machine learning is the way of the future. With new algorithms being implemented into AI, smarter faster data driven decisions will be made to optimize business performance and production. A wise man once said “work smarter, not harder” and with machine learning and artificial intelligence, the smartest types of work decisions will be made. Every year millions of college graduating seniors start applying for jobs as they enter into the workforce for the first time. Most applicants have just received a four year degree and have been working hard to build their resumes to differentiate themselves from the rest of the applicants. Something most applicants are lacking is the experience you receive as a college athlete. A college athlete gains experience in their four years that most students do not receive. This experience builds character and prepares students for anything that can be thrown their way. Hiring college athletes is beneficial to many companies and can bring them success in many forms. One of the main benefits that comes along with hiring college athletes is their ability to manage their time. The main job of a college athlete is to balance their sport and school work while maintaining a social life. If an athlete is not able to complete this job, there are often times repercussions. Athletes have minimal time for school work, so when it comes to performing fast and efficiently, they have mastered the skill. Hiring a college athlete means their work will be accomplished on time and with good quality, regardless of the time frame given. Most college athletes have been a part of a team for their entire life. Athletes are always dealing with different coaches, captains and teammates, so they are used to new leaders and working with different types of personalities. Due to this, they are able to put aside differences and work together with others to achieve a common goal. They are also able to create bonds and connections with new people. In a workplace, this skill would be beneficial to working with a team on projects for the company, adjusting to new leadership when changes are made or blending in with the overall vibe in the company. A student athlete is always adapting and overcoming some form of obstacle. Between adjusting school schedules for games and weather issues, or adding new plays and learning new drills, there is always something new. They are used to having to change between different teams, coaches, and teammates, making them able to overcome anything thrown their way. This skill is useful in a company because they are able to utilize different skills, but can adapt quickly when new ideas or systems are put in place. Communication skills are very important in any part of life, especially in the workplace. Student athletes have been developing communication skills for as long as they have played the sport. As part of a team, athletes must communicate with their teammates and their coaches in order for things to run smoothly. Student athletes also had to learn to communicate with coaches when going through the recruiting process. In a company, employees have to communicate with other colleagues, clients, and bosses everyday. Student athletes are used to communicating, and will not have a problem when things need to be addressed in the workplace. Student athletes are well rounded and have developed skills in their four years at school that make them beneficial in the workforce. These driven, young minds can bring new ideas to the company as well as skills that normal post-graduate students have yet to develop. Hiring a college athlete brings many benefits to a company and is helpful to their success in the long run. Usually finding the best fit candidates for a position can be a very taxing job for the hiring manager. Applicant tracking systems can effortlessly filter out unqualified candidates from the qualified ones by filtering capabilities and skills matching. Machine learning and other new technology are introducing new “Best Match” capabilities to highlight this feature. ATS users customize, manage, and control offer letter set up to include hired data and salary information. They can then send letters out for approval to anyone in the company; not just licensed ATS users! There is no limit to the amount of people that can be involved in the process! Users simply assign individuals to participate in review and choose the preferred order of email receipt. Our system sends an email that includes a secure link to each established point of contact. Recipients then can review, approve, reject, and comment on letters to continue the process forward or send it back to its creator for updates. Completed fields are recorded as variables and fed into both the offer letter and incorporated third-party payrolls if applicable. Once the offer approval process is completed internally, confirmed offer letters are sent directly to the intended new hire. Forms are equipped with e-sign technology allowing individuals to review, respond, and sign seamlessly on the go. All data is recorded securely and accessible to recruiters in the ATS. Our system integrates with several payroll providers, making it easy to accept approved and signed offer letters to streamline the final steps of hiring. We don’t charge any fees to integrate! The offer letter approval tool will regain hours lost that involved tasks without automation. Best of all, it will eliminate room for error while tracking team compliance. An applicant tracking system is essential for recruiting, even on a tight budget, but many applicant tracking systems can be quite costly and not entirely efficient. Look for an ATS that is not only affordable but provides all of the features that you need for hiring. At Pereless, we have never lost a deal due to price. We are the most affordable enterprise solution on the market.